Breaking: KVSC reports that Henry Oertelt has died. Oertelt, of St. Paul, has told his story around Minnesota for over 40 years, mostly in speeches at colleges, high schools, and churches. 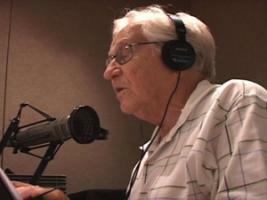 In recent years, he worked closely with the station to record his memories, so they would live on in podcasts. “It would be available all over the world. The story and my book will be listened to for many years to come, after I’m gone,” he said. I visited with him in his home a few years ago. Find the interviews with and about Henry here. And you can find KVSC’s marvelous work on Mr. Oertelt’s project here. The Challenger did not explode, the crew did not die instantly, mostly people did not see the event live, the disaster was not caused by the cold, and shuttles do not now have ejection seats. National Geographic challenges what we think we know about the disaster that happened 25 years ago today. 2) THE MOST IMPORTANT QUESTION: WHY? While the top news in the rest of the world was the rioting in the Middle East, much of the U.S. audience got the latest on Charlie Sheen’s lifestyle. Even when news organizations talked about the rioting, there was very little to explain why all of this is taking place. Foreign news isn’t our strong suit. Even NPR has failed as this blog post attests. Here’s a country-by-country breakdown of why it’s taking place. At the heart of the protests, the Washington Post says, is resentment. Some have. Some haven’t. Here in the U.S., we respond quickly when other nations clamp down on Twitter and the Internet. That we can relate to. But as Wired points out, the Internet isn’t a big player in Egypt. When the uprising ends — probably in success — there will be some who will say it shows the power of Twitter and the Internet. They’re wrong, according to Wired. This situation is changing quickly. Live TV coverage can be found on al Jazeera’s English channel. 3) IS IT TIME TO GET OUT OF THE RECREATION BUSINESS? A string of budget cuts passed the Minnesota House yesterday and lawmakers are warning that more painful ones are on the way. In Moorhead, a question being asked may be next for many cities and counties: Why are we in the recreation business? Moorhead is thinking of selling its two golf courses, the Fargo Forum reports. Golf was once a popular sport in Minnesota, with more rounds played per capita than anywhere else in the country. But participation has dropped precipitously in recent years. Lawmakers say everything is on the table during our budget crisis. What about recreational facilities and programs? Are they valuable to you? 4) ARE SMALL AIRPORTS A THREAT? There’s a metaphor here somewhere in this video posted this week from someone’s backyard in Minneapolis. Anyone want to take a stab at what that metaphor might be? Today is the 25th anniversary of the Challenger explosion. NASA’s shuttle program is coming to a close. What should come next for America’s space program? At noon today — on MPR’s Web site — Minnesota Public Radio News and the local newspaper, Hometown Focus, will discuss challenges facing Minnesota’s rural hospitals. Hometown Focus is hosting the online forum examining issues facing Virginia’s hospital. Midmorning (9-11 a.m.) – First hour: Medical malpractice reform: Will it really reduce health care costs? Midday (11 a.m. – 1 p.m.) – First hour: Protests in Egypt, Tunisia, Yemen, Lebanon: What it means for the Mideast and the world. Guest: Egypt scholar Diane Singerman of American University. Science Friday (1-3 p.m.) – First hour: Political activists in North Africa, logging onto Facebook to publicize their protests. Second hour: Digital music sampling and copyright. All Things Considered (3-6:30 p.m.) – Two state Senate committees will meet this afternoon in Hibbing to hear testimony on plans to streamline environmental review for mines and other projects. In northeastern Minnesota, people want jobs, and they also want to protect the environment. A proposal for the state’s first copper-nickel mine has been under review for five years. And more mining projects are waiting in the wings. The Senate committees on jobs and economic development, and the environment and natural resources, will hear from local residents. MPR’s Stephanie Hemphill will have the story. MPR’s Jess Mador says a financial literacy program held at the Urban League in North Mpls is about to graduate its first group of students. The program is two years long and has a success rate of more than 90 percent. MnSCU board of trustees will announce finalists in their search for the system’s next president on Monday. Tim Post’s story willl assess how the current chancellor has done over the past 10 years, and what sort of skills the next chancellor will need to have. Credit for the crow video in Bob’s No. 5 goes to Antonio Rodriguez, who cooked the macaroni and patiently waited with camera. I downloaded Mr. Oertelt’s story a few years ago (likely when you wrote about it). I still keep it on my ipod and listen to it periodically. As for fences around airports, they are only meant to be a deterrent in the first ring of security. In effect, they do little more than keep kids from playing ball on the greenspace. But that is the thing with security. Think about it, people put deadbolt in doors that are 90% glass or have glass panels next to the bolt. Silly isn’t it? To be protected by 1/4 glass?. So what stops people from breaking in? Not much really, other than the sound. If people see or hear someone breaking glass, they look out their windows and call the cops if they see something suspicious. Same with an airport. If someone walking in a fenced off area is spotted, chances are the cops might be called. The first ring of security is always the lightest.